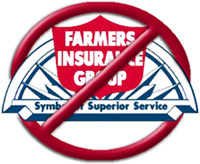 This site is published as a public service to warn consumers of the business practices of Farmers Insurance Group. This site is in no way affiliated, connected with, or sponsored by Farmers Insurance Group or any of its subsidiaries. All content and information on this site is my opinion or the opinion of those referenced. This site is for educational purposes. The information in the Forums or from other people, blogs or web sites are provided at face value, we have not confirmed any of these stories/opinions. Copyrighted material has been used for non-commercial purposes only. By accessing this site you agree to immediately contact us to report any incorrect data or misrepresentations of facts. We are not responsible for accuracy in story content. Individuals, news organizations, companies or government agencies referenced on this web site do not endorse this web site and are not affiliated with it (copyrighted materials used without permission). Links to any other sites are for informational purposes only and should not be considered an endorsement of the site.